Great kora players aren't rare in West Africa, but faraway in rainy Seattle the sound of the 21-stringed griot's harp is considerably less common. If you're looking for that taste of Mandinka music in Western Washington, a good first step is to find out where Kane Mathis is playing. The young musician -- who also plays oud -- has spent years studying the kora and the culture from which it comes. And he's at the heart of these two new CDs. When I first saw Kane Mathis, he performed with a djembe player and sang little. His new album with The Sahel Band shows great leaps in musical confidence from that time, as he sings strongly from the opening notes of "Bantam Ba Kouyate" (also the name of his first album, now out of print album) and plays kora with something approaching a master's flair, even if he's a bit young for me to use that label comfortably. 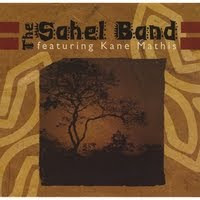 The band Mathis has assembled -- Sam Weng on percussion, Nina Vukmanic on bass, Rusty Knorr on drums -- seems to share his vision for music that's rooted in West Africa while including modern sounds. Styles range from kora-rock to highlife to desert guitar rock, particularly on the scorcher "Sahel." Mathis doesn't (yet) have a high profile in global music circles and would probably recoil from direct comparisons to musicians who come directly from griot families, but for pure musical enjoyment and this dance-inducing album is a match for any recent African releases. If not for the bit of selfishness in me that wants Mathis to stay nearby, I'd suggest him as an inspiring opening act for anyone from Angelique Kidjo to Tinariwen. On Just 4 U (named after a music venue in Dakar Senegal), Mathis is a full partner in an Afro-jazz outfit led by pianist Andrew Oliver and rounded out with Chad McCullough on trumpet, Brady Millard-Kish on acoustic bass and Mark DiFlorio, drums. They're a tight combo, trading support roles and solos with ease as they work through the albums 11 tracks, ranging from traditional pieces to the whimsically titled "The Funnel and the Vacuum Cleaner." If I have any quibble with the album, it's that the trumpet often sounds like it was recorded in a different room than the rest of the band, a small but distracting issue. Given the frequent exchanges between kora and trumpet, some of the music reminds me of the sublime album Sira by Ablaye Cissoko & Volker Goetze. A different flavor emerges on "Segu," on which guitar (by Mathis) and calabash take the listener to somewhere near Ali Farka Toure's Niafunke. Then there's the lilting soukous flavor of "Bina Na Ngai Na Respect." And they don't neglect the griot tradition of praise songs; "Hidmo" pays tribute to the Seattle restaurant that hosts weekly African music nights. Different flavors, one amazing CD that's sure to be embraced by both jazz and world music fans. Great profile on Kane Mathis. I had the fortune of taking a wonderful ethnomusicology course at the University of Washington, and he was kind enough to come play for us a few times. When Habib Koite and his band came to class, he accompanied them as well! Excellent stuff. Great to see this up here! 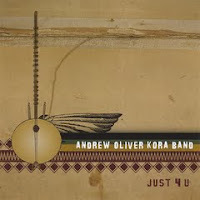 I am Andrew from the kora band, just wanted to point out that it is in fact Kane playing guitar on "Just 4 U" and we're working on a new record with much better trumpet tone! Kane is a great musician and I feel lucky to have him in our band, as you can tell his other projects are killer too. Thanks for the note. There's some new tracks up at http://andrewoliverkoraband.bandcamp.com to listen to and download too.